/UCW/ SEOUL, SOUTH KOREA – Leo Motors Korea Inc., a subsidiary of Leo Motors, Inc., entered a contract with Miho Story, Inc. for the sale of 500 smart phone vending trucks. The contract amount is approx. $300 million, and the total order is 1,500 trucks. The truck design and operation solutions were developed by Leo Motors Korea. The vending trucks will each be equipped with a high efficient Energy Storage System (ESS) developed by Leo Motors Korea, and will relate to the cloud server and the vehicle diagnosis system developed by Leo Artificial Intelligence Connected, Inc., Leo’s other subsidiary. Also, the ESS will be swappable using Leo’s patented cartridge battery system. Using ESS, the trucks do not need to utilize Internal Combustion Engines, and thus do not emit pollutive gas while using electricity to market smart phones and their accessories on the street. Connected to Leo’s patented Multi Drive Recorder (MDR), the vending truck operators can move with real time to the hot places where they have higher sales potential. Leo’s connected car technology also provides anti-theft, on road battery swap, and real time maintenance services, as Leo’s MDR always scans every component of the vending truck. Miho Story has been one of the largest mobile phone marketers in Korea for the past 10 years. They have patented the business model of the smart phone vending truck. Currently, the Korean government does not allow the Internet and mobile sales of cellular phones to prevent phone fraud. The cellular phone marketer must verify the purchaser’s official Identification Card using an ID scanner. 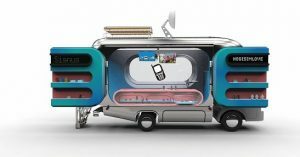 Miho’s vending truck will deliver smart phones on the street, as well as those ordered through the Internet, and on mobile devices. This press release includes “forward-looking statements” within the meaning of Section 27A of the Securities Act of 1933, as amended, and Section 21E of the Securities Exchange Act of 1934, as amended. In addition to statements which explicitly describe such risks and uncertainties, readers are urged to consider statements labeled with the terms “believes,” “belief,” “expects,” “intends,” “anticipates,” “will,” or “plans,” to be uncertain and forward looking. The forward-looking statements contained herein are also subject generally to other risks and uncertainties that are described from time to time in the company’s reports and registration statements filed with the Securities and Exchange Commission.